I was really glad Lori left us her instructions for the next row of the row-a-long at Bee in my Bonnet. I've been watching for it since I'm kind of at loose ends and anxious to keep up. I should be working on past projects but I'm busy with other things so it is hard to get into it. And I'm having a quilt retreat at my house this upcoming weekend so I hate to get going on too much before that. Anyway, I added the 3rd row, which is the chevron row. It was quick and easy and I don't think I made any mistakes. Yay. I put my rows together. I like doing that as I work on a project like this, rather than leaving them to the end. 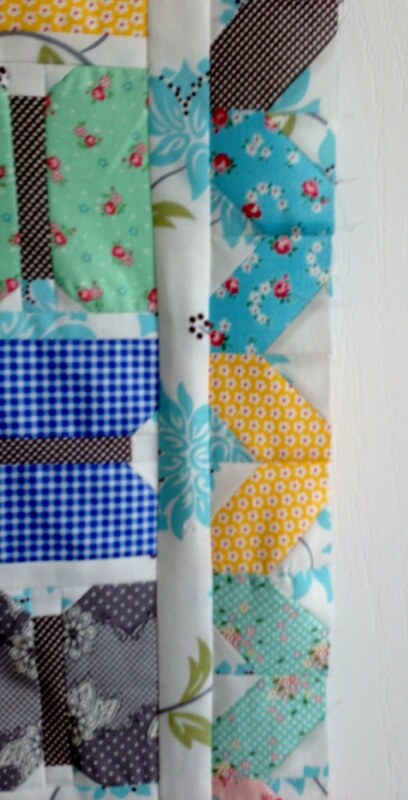 Usually I'll group the rows into 3 parts so it is easier to work with and then at the very end put the groups together. Do you do that too? I do like the pop of color and pattern in my large scale background fabric. It may not really look great at this point but I'm going to make this my only border and make the outside border chunky and scalloped. I'm not sure what vision Lori has for the project border but that is what I see for mine. At least now. I've enjoyed the simplicity of the rows and I think my butterflies don't look too bad from a distance. 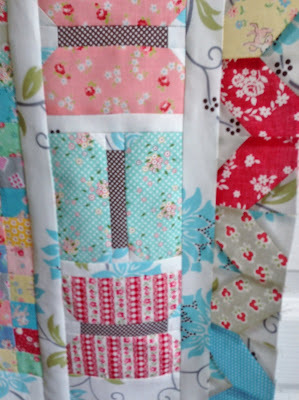 Once it is quilted I don't think it will matter at all. Now I wait for row #4 next week. Tapping my foot while Lori is gone. Or maybe I'll work on some applique that has been going on for years. I should do that, shouldn't I? My son Mason waited at the ATT store all night long Thursday night and I met him there in the AM early on Friday. We did get new phones. He has been saving for months since his old phone is an iphone 2. I gave my (old? not old) 4s phone to my daughter since she super needed a new phone. So I felt like I could splurge. I have already spent too much time using the iphone 5. 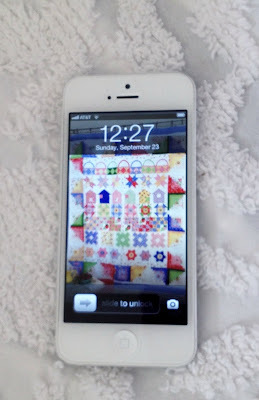 I put my PKM fabric row quilt as my wallpaper. Super cute I think. Busy week for me ahead. You too? I'm excited about my family coming for the retreat. Morning Nanette - I'm waiting for the retreat you have at your house for your close friends in Colorado. LOL. My daughter is anxious to get the new iPhone and I get her "old" one. I've never had a "smart phone". Your row three looks good. I'm ready to make mine too. You're way ahead of me. 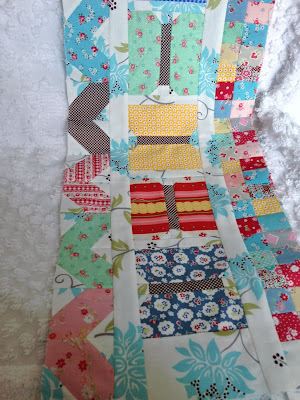 I'm too afraid those rows won't actually get sewn together to well, sew them together. I'm afraid that there will be thinks between them. I'm a scardy cat. I love this! As usual Nanette, you rock your colours! Your quilt is looking great! Enjoy the retreat!! 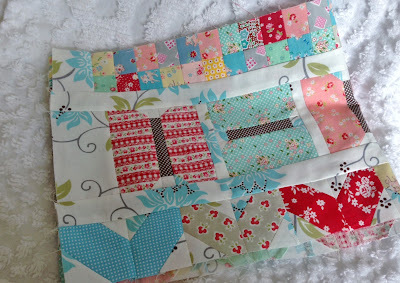 Love your quilt progress! And I have a new phone headed my way too... can't wait! Lucky you with the new phone. My son is obsessed with the new phone too. I like the rows, I may regret not jumping in and joining along. Looking good Nanette! And you got the new phone! Is it all it's cracked up to be? I've been delaying the OS upgrade to my phone since there are a lot of complaints about the new map service. I LOVE the googlemaps that we currently have -- even more than my car GPS -- and I'm not even a GPS sort of person. So...I'm not too happy that this cool map is going away. Looking so pretty - have fun with family! Love your rows. And I think they look great sewed together. 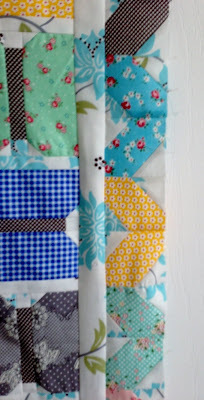 However, I think I remember reading that we are not to sew these three rows together. They do not go together. nanette, what is the fabric you are using for your background? 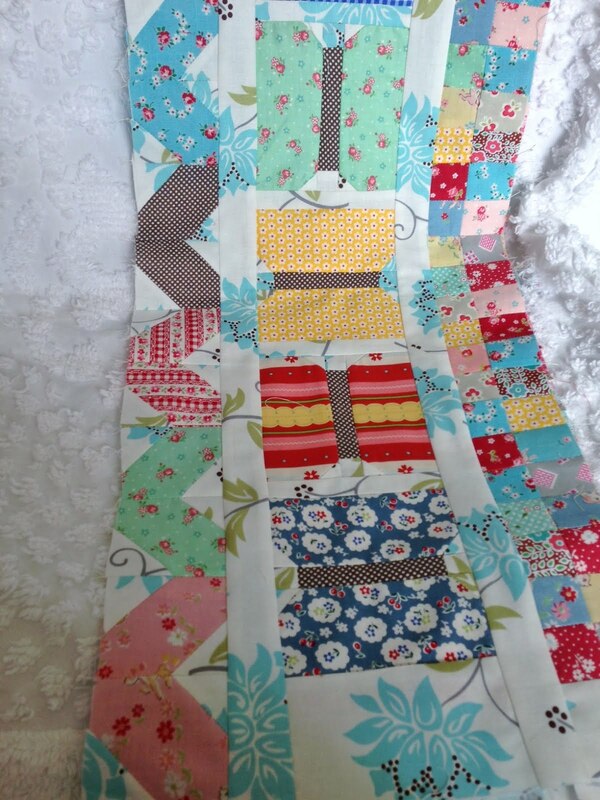 great choice of fabrics for your rows! love your fabrics. So you put your rows together already. It will be interesting to see what Lori does. What ever it is I know I will like it. Another gorgeous row! It turned out cute, Nanette! I am loving rows one two and three!!! I just can't stand it. I am planning my retreat that is in 3 weeks... and as soon as I'm done, I'm on this! I just love your rows Nanette. Have fun with everyone at your house! 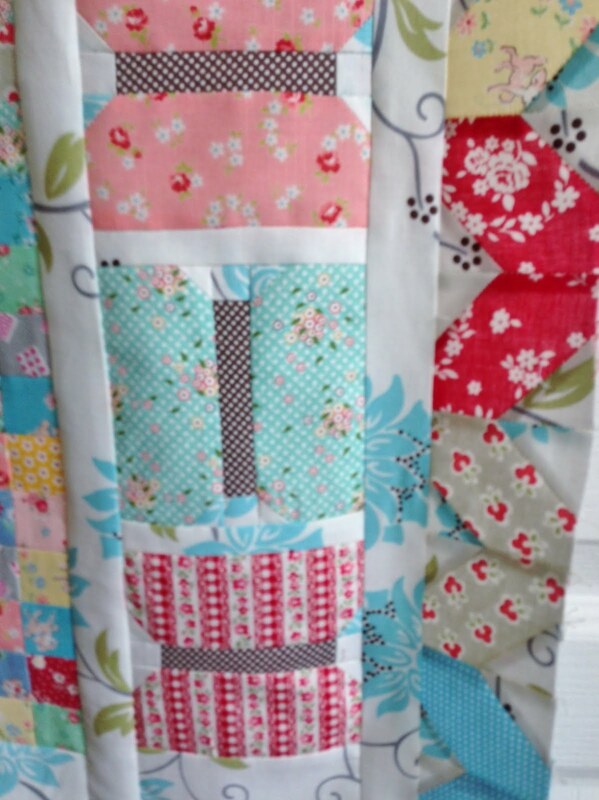 I just love your rows and the fabrics you are using! It will be fun to hear about your family get together, too...you always have such a good time sewing with your sisters! I love to do a two and three! ! !I just can't stand it. I plan my solemn and respectful in 3 weeks... Once I'm done, I'm here! I just love your line nannette. Everyone had fun in your house!